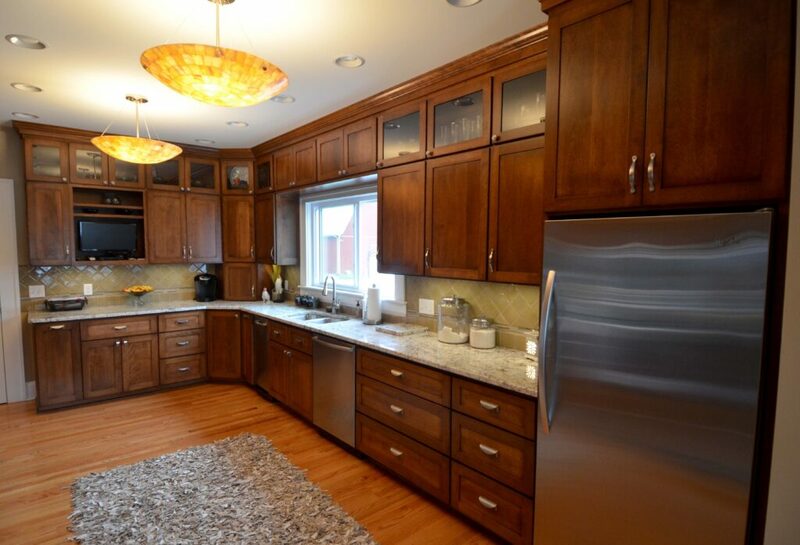 Rich, birch shaker cabinets welcome friends and family into this spacious gallery style kitchen. Details abound on the surface and deep within the cabinetry, making this kitchen not only stunning but convenient. 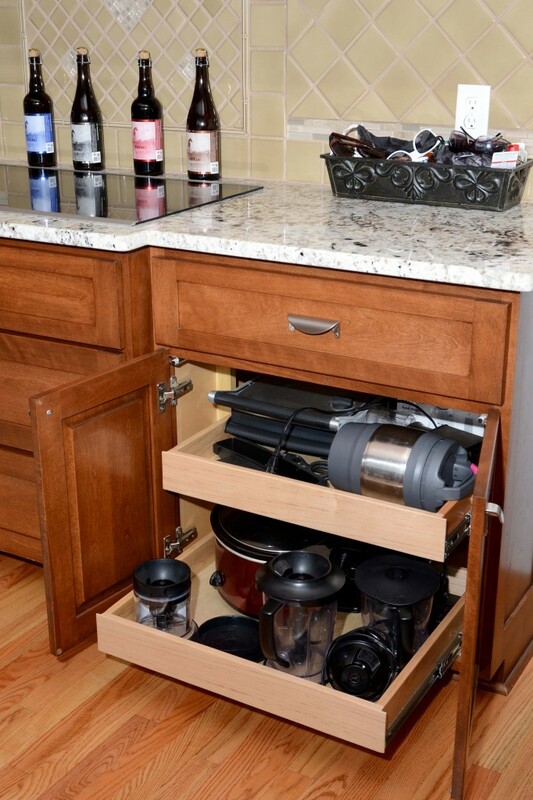 Hidden behind the layers of deep amber wood are components of modern day living; utensil divider drawer inserts, pull out appliance trays, a lazy Suzan tower, tray divider pull out and a spice tray pull out cabinets, as well. All this organizational storage contributes to this kitchen not only being breathe taking but enjoyable to function within. Who wants to open these cabinets, though? The exterior façades, by itself, awakens ones aesthetic senses. The kitchens most prominent accent feature is located perfectly to receive a flood of natural light. This cooktop feature area has decorative subtleties that enhance the beauty without shocking the design. Specifically, this area is subtly pulled out into the kitchen’s working space and then highlighted with a shaker box wrap hood cabinet which is complimented with a recessed decorative plate shelf. Just below all this elegance is a tone on tone accent mosaic ceramic tile block design. A boarder of glass pencil line accents married next to 4 x 4 tiles encompasses additional tiles laid in a diamond pattern to create contrast and visual interest. This pattern is simplified and continues around the kitchen harmonizing the remaining backsplash. 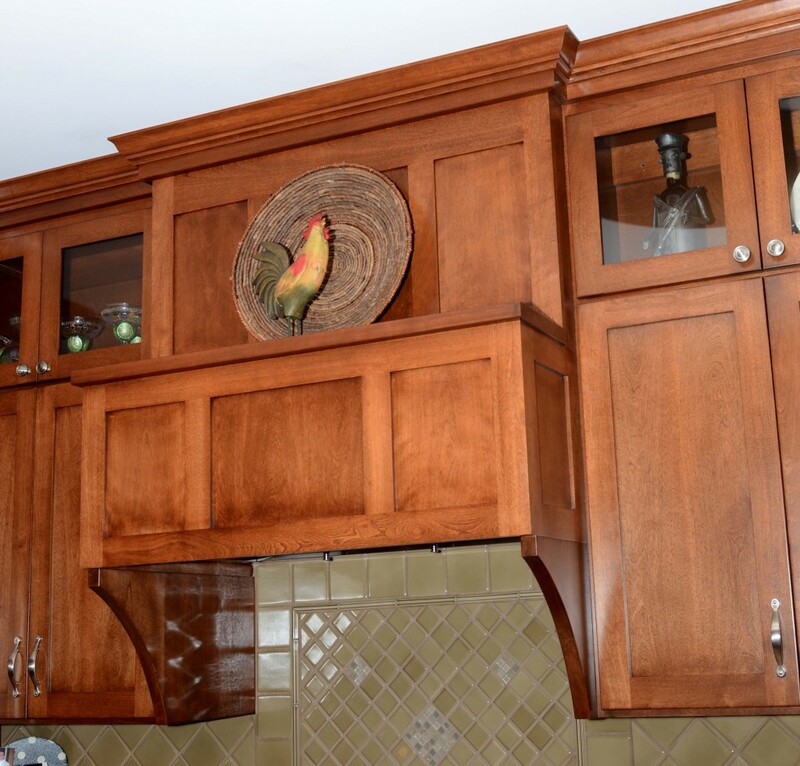 To further emphasize the importance of this work station it is flanked with 2” style cabinetry blocks that are installed both on the base and the wall cabinets; on each side. 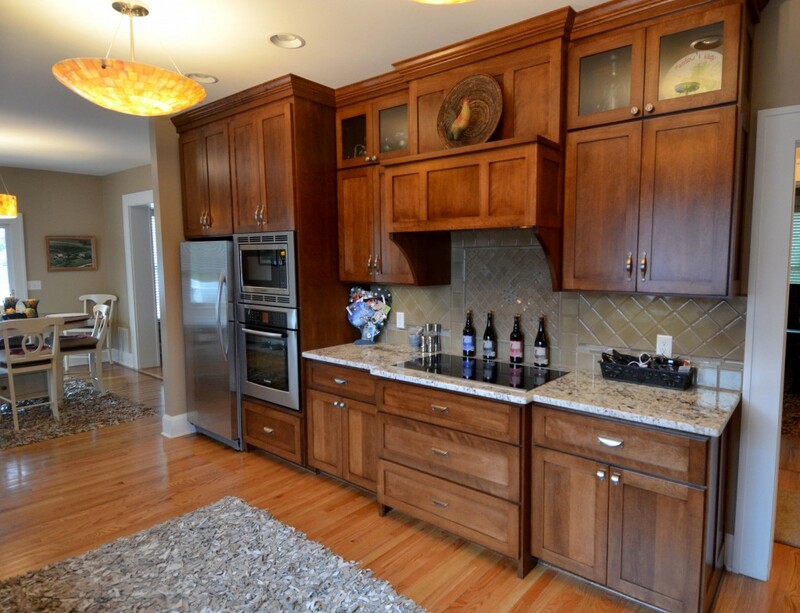 However, this kitchen has more to offer than a featured cooktop work station and an abundance of cabinet components. Additionally one will discover; open shelving for an inset television viewing area, massive 2 piece crown molding that demands attention, stacked upper cabinets featuring glass door inserts, hardwood refinished oak floors and granite counter tops full of contrast for eye popping elegance. But wait one should mention, natural light is not the only source of lighting in this space. A combination lighting approach brings warmth, ambiance and clarity to this jewel of the home. Can lights, installed perfectly to flood all working stations with appropriate lighting, and mosaic pendant lighting spotlight this amber gem of a kitchen.